As the new year begins, it’s time to toss out the old and bring in the new, and that includes your aging plumbing pipes. Recognizing the signs of an aging plumbing system and developing a plumbing pipe restoration plan can help you prevent water catastrophes. Plumbing pipes are not typically designed to last forever, even if the material has the potential to last forever. A variety of factors can contribute to the deterioration of your Chicago building’s plumbing system, including acidic water, grease and other foreign objects being pored down drain lines and water pressure that is too high. According to Houselogic, water supply pipes are designed to last between 20 and 70 years. Drain lines are designed to last at least 75 years, assuming proper maintenance. While you may not pay much attention to your plumbing system when it is functioning correctly, you do want to watch for signs that your pipes are reaching the end of their useful lives. The first clue is the age of your plumbing system. If your plumbing system has been in place for several decades, there’s a good chance your pipes are experiencing deterioration, especially at the seams and joints. You have noticed mysterious puddles or damp interior walls. You’ve noticed an increase in your plumbing repair bills. Your residents are complaining of low water pressure. Your water bills have unexpectedly increased. Once you realize your plumbing pipes are in imminent danger of failing, it is important to explore your options and create a plan to replace or restore your pipes. At first glance, replacing all the pipes in your Chicago building may seem like the perfect solution. If you replace all of your pipes, they will be new and give you the entirety of their expected useful lives. Unfortunately, whole building plumbing pipe replacement comes with additional expenses and man-hours. When you opt to replace all of your plumbing pipes, the plumbers must locate and remove every single plumbing pipe. This often means cutting through drywall, floors and ceiling and removing finishes in order to reach the pipes and remove them. This can greatly increase the cost of your plumbing pipe replacement and the time it takes to complete the job. Instead of a total pipe replacement, you may want to consider a plumbing pipe restoration, especially if many of your plumbing pipes arelocated within walls, masonry or concrete because these areas are left in-tact. Plumbing pipe restorations are also much faster than a traditional pipe replacement. For example, Glen Royal Apartments noticed that their indoor spa was constantly losing water. In fact, that was the only symptom. The staff members would fill the spa, and the spa would lose water. There were no puddles or other signs of a water leak. Upon inspection, it was determined that the copper pipes were extremely corroded and leaking water. They were also located within concrete that would have to be jackhammered for a traditional pipe replacement. Instead of choosing to replace the pipes, they decided to restore their pipes with Nu Line. The job took four days, and the concrete and other finishes were left intact. Here at NuFlow, we can create a custom epoxy pipe lining solution for your aging plumbing pipes. Our technicians can inspect your corroded, damaged or leaking pipes and determine if they would benefit from a plumbing pipe restoration, and we can provide you with an estimate to line your plumbing pipes. It’s all part of our building pipe assessment service, which can help you make the decision to replace or restore your plumbing pipes. 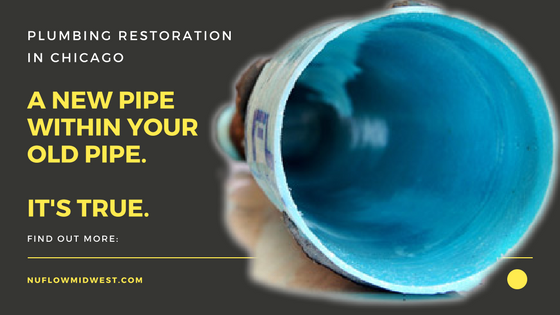 To learn more about our plumbing pipe restoration solutions and to schedule a building pipe assessment, call us at 815-790-9000.